Lebanon Valley College hired Spillman Farmer Architects to transform an outdated, underutilized student center into a vibrant hub for student life. The project required a holistic design approach, as it addressed several critical building components including new facades, building additions, and interior renovations. The project includes a dining hall, lobby, bookstore, conference rooms, theater, event space, and lounge areas. The Center now has a new entry a glass wall system brings the building a fresh look, identifying its importance on the campus. The visual depth created by the new facade creates multiple layers of spatial experience throughout the building. The dining hall features an active scatter servery layout, new kitchen addition, and expanded seating. Daylighting strategies were deployed wherever possible in the center, and most spaces benefit from skylights or additional glazing. 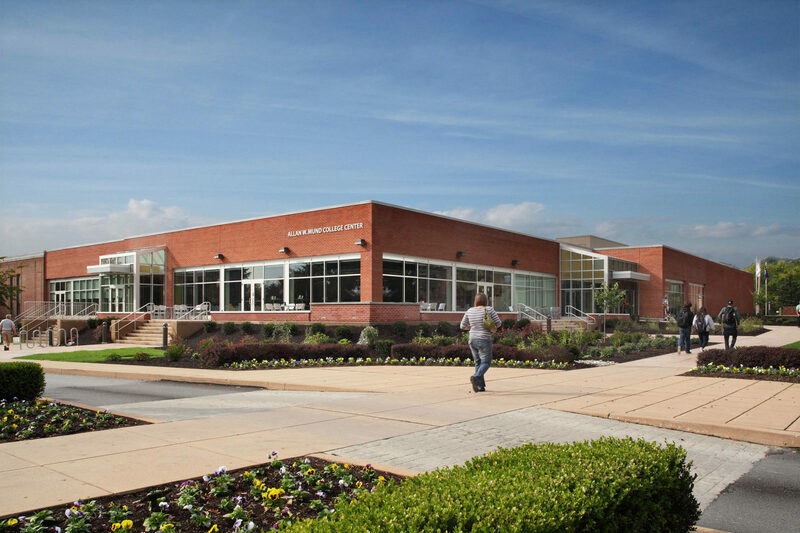 The Mund Center is a LEED Silver Certified project and the first sustainable building on LVC’s campus. Sustainable elements include rain gardens for stormwater filtration, daylight harvesting systems, low-VOC materials, increased insulation, and complete HVAC system replacement.